Star Wars: Battlefront 2 Official Gameplay Trailer | Nerd Much? EA has unveiled the official gameplay trailer for Star Wars: Battlefront 2 and apparently, they’ve been listening to fans after the crash of the first game. EA is promising intense and detailed story mode taking place between The Force Awakens and The Last Jedi, focusing on the Dark Side instead of the usual Jedi. Battlefront 2 will also have a free DLC, multiplayer across all Star Wars eras, and split screen co-op. All much needed and demanded ever since Battlefront 1. Each free DLC will have themed seasons that will keep the community alive with new locations, characters, vehicles, modes, weapons, star cards, and more. The first of which will be coming this December after game’s launch. This first season will include Finn and Captain Phasma as playable heroes, a new planet called Crait, space map, events, and rewards. This will be the beginning of regular live events and challenges that reward players with unique loot. The demo at EA Play is the Assault on Theed in a multiplayer mode called Galactic Assault, the map is the ever-beautiful Naboo set in the prequel trilogy era. This shows off the new class system, ground and air vehicles (the starfighters look like a great time). 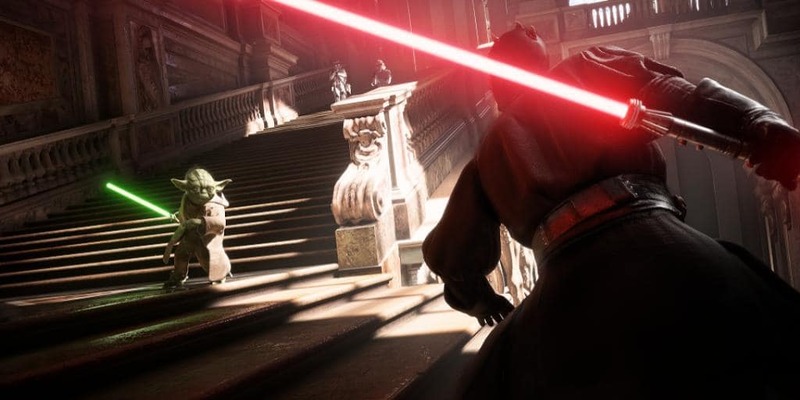 Characters included in the demo are Boba Fett, Darth Maul, Rey, and Han Solo. More details of the story mode are sparse, not really expanding on what we already knew from the reveal trailer. Battlefront 2 follows Iden Versio, whose voice actress we saw on-stage at the conference, an Imperial elite special forces soldier. We will finally get to see the other side of the story, on the team of the usually disposable villains. There will be everything from “intense dogfights in space” to on the ground shoot-outs. Star Wars Battlefront II releases November 17, 2017 on PS4, Xbox One, and PC. Players looking to get into the game earlier can do so with the Star Wars Battlefront II: Elite Trooper Deluxe Edition starting on November 14, or through the Play First Trials on EA Access and Origin Access starting November 9.